Originally published on Cloud Four’s web site on August 1, 2012. That may be part of the story, but I think there is better explanation, and thanks to Akamai, we have data to support it. In June, Akamai released Akamai IO which provides us with a view of the web we’ve never had access to before. It aggregates web browsing data from Akamai’s clients. For those unfamiliar with Akamai, they are a content delivery network that is used by many major web properties. The means that their data is likely to be a more accurate reflection of web traffic than we’ve had from other sources in the past. They see more data and the sites their clients have are the popular, mainstream sites that everyone visits. 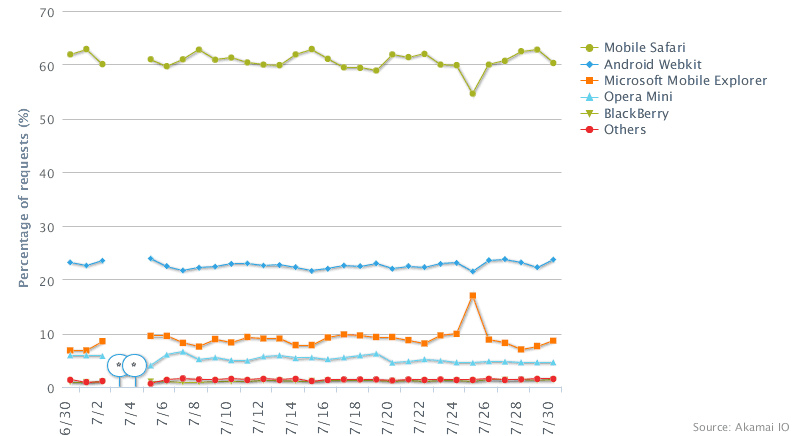 Akamai graph showing Mobile Safari dominating Android over the last thirty days. Click on map for larger image. 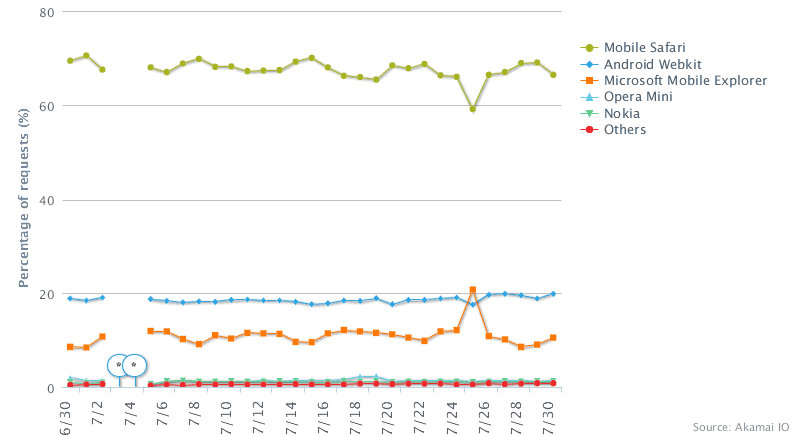 Akamai graph showing Mobile Safari with an even wider margin on non-cellular networks. Click on map for larger image. Again, no big surprises here. 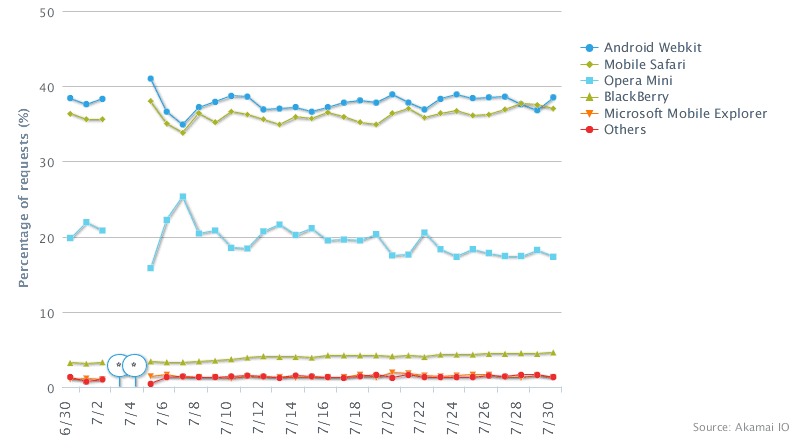 If anything, Mobile Safari’s lead over Android has increased. What about if we look at traffic on cellular networks? Akamai graph showing parity between Mobile Safari and Android on cellular networks. Click on map for larger image. Now that’s interesting isn’t it? iOS and Android are neck and neck when you look at web usage on cellular networks. So the question becomes not why do Android users not browse the web as much as iOS users do, but why don’t they browse the web on Wi-Fi connections? Currently, yes—most of the Web sites sampled for the Akamai IO Beta are focused on a U.S. audience. Therefore, while the data in the reports includes many visits from across the globe, it is biased in favor of U.S. clients. As we grow the sample size, we’ll no longer have this bias, and in turn be able to introduce geo-specific views of the data. To my mind, the U.S. bias makes the difference in network usage even more striking. Many cities in America have abundant Wi-Fi locations. Why don’t Android owners use those hotspots? The UI for joining a Wi-Fi network on Android is easy to miss. iOS frequently prompts you asking if you would like to join a Wi-Fi network. The prompt to join the network takes up the screen and interrupts what you’re doing. In fact, it can be a tad annoying. Android, on the other hand, puts the notification as a subtle indicator in the notification bar. This is easy to miss if you’re focused on other things or if you’re a new Android user—which by the way, many Android users are because the majority of first time smartphone buyers choose Android. 2. People at lower income levels are less likely to have access to Wi-Fi networks on a regular basis. I believe a lot of differences between iOS and Android can be attributed to income level differences between the users of the devices. Last year, Comscore published data showing that 81% of iPhone owners in the United States were above the median income level. I’d love to see more recent data and be able to compare it to Android, but every time I’ve seen demographic data, even if it doesn’t explicitly address income levels, it seems to hint at the fact that Android users have lower household incomes than iOS users. People at lower income levels are less likely to also own a computer and therefore less likely to have broadband at home. They are also less likely to work in an office setting with abundant broadband and Wi-Fi. As an aside, I believe income level disparity also helps explain the differences in app store success. There are many factors, but demographics need to be included when people compare the platforms. It probably goes without saying, but if you’re on a Wi-Fi network, you probably have a faster connection and you’re usually not worried about the amount of data you use. Having a faster connection and no worries about your bill increases the likelihood you will browse the web more. The friction for browsing goes down tremendously when you’re on Wi-Fi. Even with Akamai’s data, we’re still just theorizing on what is going on. But I do believe that the data provides the first clue as to what might be happening. And if Google is smart, they’ll dig into this disparity further to see if there is something that can be done to increase the likelihood that Android users will connect to Wi-Fi networks. As outsiders, we can watch these metrics to see how well Google is adapting. Finally, I’m pleased to have an opportunity to talk about Akamai IO’s data. It’s a great service that they’ve provided. And I know they have plans to make it even better. I suspect it took a lot of work to reassure people that it was ok to publish this information. So thank you to those inside Akamai who championed it. And for the rest of us, let’s put this data to good use. Published here on August 29, 2012. Jason co-founded Cloud Four, a mobile design and development agency, and founded Mobile Portland to educate and support Portland’s mobile community. He also co-authored a book, Head First Mobile Web. 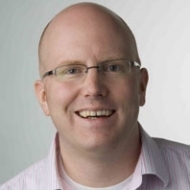 You can follow Jason on Twitter at @grigs. Some Thoughts On “Designing in the Browser” by Stephen Hay Stephen Hay on designing in the browser. The Curse of a Mobile Strategy by Jared M. Spool Jared Spool weighs in on whether to create native app or web app.